Olympus's Stylus TG-2 is their new leader in the "tough" or "lifeproof" camera category. Sporting a 12-Megapixel CMOS and powerful processor, this camera will also perform as well just about any other compact digicam. Add its stylish and very protective body and you have a camera that can handle just about anything. Read more in our Full Conclusion. 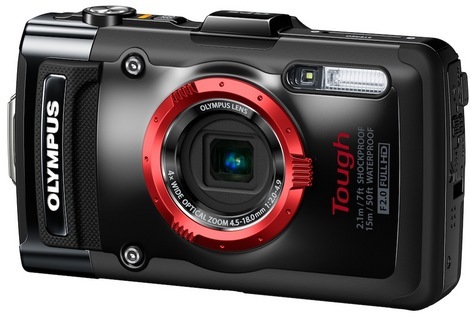 Building on the success of the TG-1 iHS, Olympus introduced their 2013 Flagship tough series camera, the TG-2 iHS. This model takes everything we loved about last year's model -- the f2.0 lens, iHS (intelligent, high-sensitivity and high speed) technology, and Full HD 1080p video recording -- and improves it. The waterproof rating has been bumped up ten feet to a full 50ft (15M). Combine that with specs like Freezeproof down to 14°F, Shockproof up to a 6.6ft (2M) drop, Crushproof up to 220 pounds, and Dustproof, and you've got one tough point-and-shoot, ready to go wherever you need to take it. Much like last year, we've got a 12-megapixel BSI CMOS image sensor with a 4x optical zoom lens that can even shoot stills at 60 frames-per-second (at a 3-megapixel resolution). The f2.0-4.9 lens allows for optimum control over low light shooting conditions and even feature a Manual Aperture Priority mode for DSLR-like precision. In addition to fun features like 11 Magic Filters, which help stylize your photos, the TG-2 also boasts a built-in manometer, which records depth, elevation, and even warns you if you get too close to the camera's 50ft depth limitation. GPS and e-compass functionality also help with geo-tagging and, in a pinch, finding your way. The Olympus TG-2 iHS is available in black or red with an estimated street price of $379.99 USD. Click on our lowest price button at the top right of this page for the most current online pricing.